- Cook the potatoes (whole) in the over, 400F, with a bit of olive oil and rosemary (for flavor). It takes about 30-40 minutes. - Remove the potatoes from the oven, and discard the oil and rosemary with a towel. - While still hot, cut the potatoes in two. Consider cutting such a way that whatever flat surface each potato might have can be used to place the cheeseburger on it. 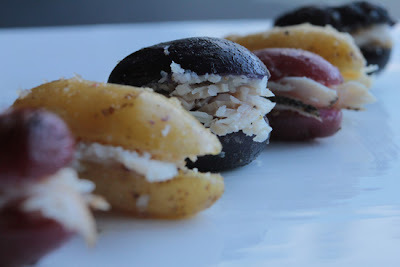 - Quickly place a thin slice of butter on the inside of each potato half, and keep it face up. - While the butter is melting, sprinkle some salt and pepper on the potatoes. - As soon as the butter melted, add the turkey breast and the parmesan cheese, and form cheeseburgers as in the image. - Use your imagination for extra brownie points on the presentation.